ŠKODA’s multi-award-winning Fabia range is set to confirm its status as the best value supermini on the market with the announcement that OTR prices for the fully updated model will start from just £12,840. The revised Fabia is set to hit the UK next month with a new all-petrol line-up, hatch and estate body styles and five trim level options – including Monte Carlo and Colour Edition. Fabia, full LED headlights. The new model also introduces an additional safety system; Blind Spot Detection and Rear Traffic Alert (£390 RRP). Blind Spot detection helps the driver to change lanes safely by registering any vehicles in the blind spot, while Rear Traffic Alert recognises vehicles approaching from the sides when reversing out of parking bays. 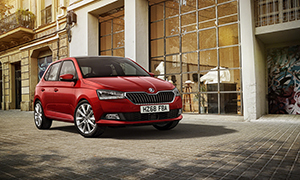 The brand’s second biggest selling model in the UK after the Octavia, the Fabia has been a mainstay of the ŠKODA range since its introduction in 2001. The third-generation supermini was launched in 2014 and has already clocked up more than half a million sales worldwide - making it the brand’s top seller in Europe.